Any carpenter and woodworker will appreciate the practical value and work output of the C12RSH. Quality and accuracy standards have indeed been met, diverse woodcutting possibilities are also present, and as far as Hitachi C12RSH reviews go, we are going to explore this excellent sliding compound miter saw in detail. Quality: The laser system addition to the saw makes it supremely accurate. It creates a cut line indication so you know where the saw blade is going to cut.Even with limited work table space, the saw is compact and its slide rail features comes designed to save more room and not stick out. Usability: A locking lever lets you position the saw in place at the 0-degree angle. This makes vertical cutting precise. A small depth adjustment knob serves as an addition to the bevel and miter adjustments. You can use this to partially cut through wood, not fully; quite flexible and used for indentations and groove woodwork. Performance: Capable of the smoothest cuts out there, the 15-amp motor rises to standards of excellence and delivers an 1850-watt output capacity. The multi-purpose fences can also be heightened for crown molding tasks. You can even flip the fences to make them longer and render baseboard cuts simple. Robustness: Despite weighing an average 66 pounds, this miter saw is quite sturdy. Stainless steel, polished components, tough industry-plastic in select spots all add to its strength. The base is ideally designed with amazing center of balance/gravity. This makes woodworking rather steady and with no way for the motor vibrations to shake things up. Hitachi’s own signature laser marker system brings immense accuracy potential while cutting risk of woodworking errors. Capable of producing 1850 watts of output power (maximum), the 15-amp motor is a blessing indeed that runs the miter saw at optimum rates, specifically 3800 rpm. The rail slide system is one of the C12RSH’s most revolutionary features because of how compact it makes the whole saw. This is usually not the case with such sliding saws.The adjustable nature of the rails makes for some amazing space-saving opportunities; great for small businesses. The fixed rail system makes sliding convenient and quick so the saw head can move at optimum speed, and the machine itself has small rear clearance. Thanks to a lack of unwanted protrusion you can stand the saw up against a wall and not worry about rear space for the rails. The miter and bevel scale range is quite good. You have 0-46 degrees to the left and 0-57 degrees to the right for mitering. A micro-miter knob makes things easy for you to adjust the scale for precision purposes. You have 0-45 degrees to the left and right. You can position your material and keep it in place while you flip the material to make opposing cuts with the saw. Such flexibility is rare. You also have a micro-bevel adjustment knob to get better accuracy in this range. 12-inch TCT saw blade makes woodworking and trimming a convenience. The dust bag gathers debris and sawdust adequately though not exceptionally so; this is reasonable. The pivoting fence can be raised to a height of 4 11/16” and makes vertical crown molding cuts quite possible; large workpieces included. Weighing in at 63.9 pounds, it is neither lightweight nor heavy; this is a good enough weight for portability, as confirmed in several Hitachi C12RSH reviews. Whether it is cutting, drilling, woodwork, concrete-work, metalwork, fastening, etc. 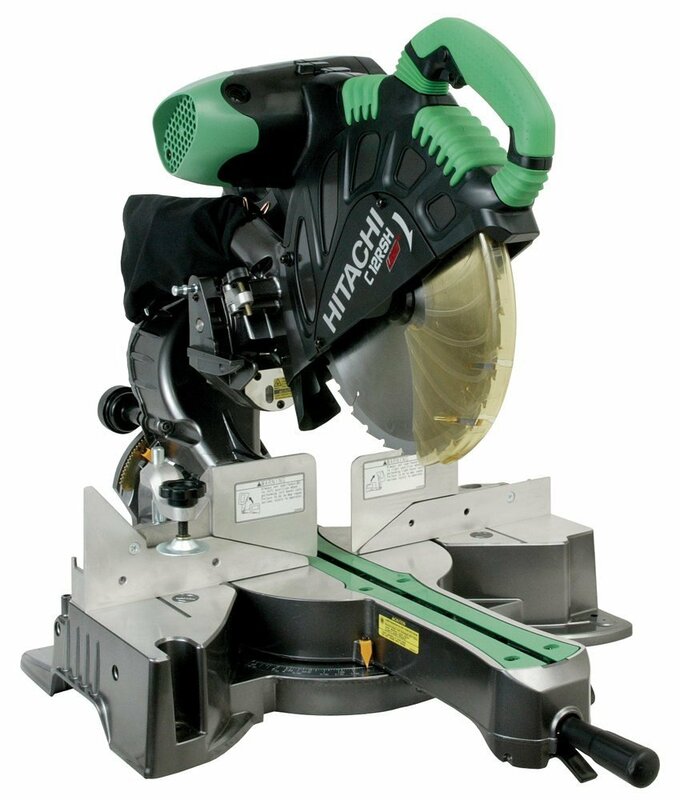 the Hitachi C12RSH brings outstanding professional-grade flexibility to the power tool industry, where it has won several awards, accolades, and recognitions, primarily thanks to what users have had to say about this specialized miter saw. DIY-ers, professional woodworkers, remodelling contractors, carpenters, electrical engineers, and other power tool users have greatly elaborated on the practicality of this saw in diverse Hitachi C12RSH reviews. It is the first ever sliding miter saw that has combined all conventional miter saw features, bonuses, and components with a radial arm saw. The design is one of a kind and efficiency ratings have gone through the roof. It is one of the most compact sliding miter saws on the market, with no rear clearance and superb work output in small spaces. The product package for the Hitachi C12RSH also contains a box wrench and vice assembly. Add that with the standard mains – a 12” 60-tooth TCT saw blade, the compound sliding miter saw itself with laser marker system equipped, and dust bag – and you have outstanding value for money where this particular saw is concerned. 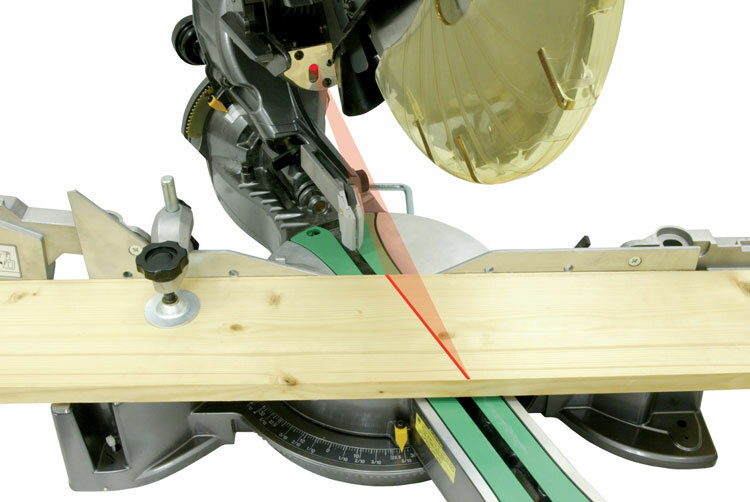 The rack & pinion gearing feature for dialing ‘micro adjustments’ is a laudable addition to this miter saw. You can place the slide tubes up, top, and to the side; great versatility. The settings are easy to read. Positioning angle locks for beveling is quite reliable. It is a bit heavy. While portability in open spaces is simple and straightforward, moving the saw between cramped or small places or spots can be quite the hassle. The dust bag, while good, is not good enough. Since the C12RSH is designed to be used in smaller spaces, the amount of sawdust and debris generated during work projects have to be taken care of. But a majority of them still linger, meaning you need to get vacuums and external dust collectors to keep the work space spotless and breathable. There are, however, no attachments for the C12RSH to be hooked up to a 2-inch vacuum line. The bevel lock can be a bit awkward but nothing a slip ratchet mechanism cannot handle. The 3800-rpm 15-amp motor is outstanding in itself. The laser marker system is one of the best features about the C12RSH. It makes accurate cutting a possibility and gets you some of the most precise cuts out there. We love this feature best. In addition, the fact that the sliding rails can be adjusted to make for compact work sessions. Being a 12-inch blade renders the machine quite large but therein lies its efficiency. While 10” blade diameters are much preferred over 12” ones, the Hitachi C12RSH stands out in this regard; it’s the exception. A fixed splinter guard feature reduces wear on the blade, reducing your maintenance requirements and frequency. This is also how you can make smooth clean cuts. A comfortable handle with a vibration-resistant elastomer handle makes for superb steady handling. A 5-year warranty, added box wrench, and vice assembly increase value for money and professional variety.